Overview - Comprised of ten episodes, and clocking in at nearly seven hours in duration, Les Vampires...follows journalist Philippe Guerande (Edouard Mathe) in his efforts to expose a vast criminal organization known as the Vampires. Joined by a comical sidekick, Mazamette (Marcel Levesque), and often competing against a rival gang lord (Fernand Herrmann), Guerande dethrones a succession of the Vampires' Grand Masters. But most evasive of all is the Vampires' muse, a seductive assassin who performs her job with deadly grace: Irma Vep. In spite of its title, and the images of the bloodsucking, supernatural creatures it might conjure up, 'Les Vampires' has absolutely nothing to do with the undead beings of European folklore who prey on the living during their nightly strolls. The name refers to an underground society of criminals which stalk the streets of Paris at night while wearing black silky outfits and an executioner's mask. Fashioned after the "Apache" subculture gang, members of the group range from petty street thugs to high-ranking officials within government. And this is the silent serial, ten episodes of different lengths shown over a period of one year, from prolific filmmaker Louis Feuillade ('Fantômas,' 'Judex') which follows the dastardly deeds of this criminal organization terrorizing the citizens of France. On the case is the dogged and intrepid investigative journalist Philipe Guérande (the terrifically expressive Édouard Mathé), who, as we soon find out, is also a quick-witted amateur detective. Unintentionally funny, he is sometimes shown as a being better at cracking a case than most in the police force. At the start in "The Severed Head," we see he is a reporter obsessed with the activities of the Vampires but equally determined to bring them to justice. Well-respected by the community and apparently a popular read for the newspaper 'The Paris Chronicle,' Guérande has informants everywhere and sent telegrams of shocking murders suspected in connection with the criminal organization. So trustworthy is the guy that the magistrate believes his innocence when a Vampire thief tries to frame him and scare him away from further investigating the organization. The first three episodes essentially function like an extended exposition, introducing viewers to Guérande's tenacious personality and the overall plotline of the series. After the reporter's dangerous encounter with the First Grand Vampire (Jean Aymé), not only a deadly foe but a master of disguises as well, the famed ballerina Marfa Koutiloff (Stacia Napierkowska) is murdered while in the middle of a stage performance, one the serial's most famous sequences. Going into "The Red Codebook," we discover Irma Vep (the lovely vamp Musidora in one of her most memorable and celebrated roles), whose name is a fun anagram for vampire, is also one of the head ringleaders, capable of some vicious acts. But keeping things from veering too dark, Feuillade adds the clownish antics of Marcel Lévesque as Mazamette, always looking at the camera with a crafty, sly smile to let us in on the humor. Things really start to pick up in "The Spectre" with the entrance of Juan-José Moréno (Fernand Herrmann), the leader of a rival gang that's almost as resourceful and lethal. Because he loathes The Vampires so much, he becomes somewhat of an accidental ally to Philipe's quest, except the former wishes to have the City of Light all to himself while the latter seeks for their incarceration and hopefully crime-free Paris. Using his talent for hypnotizing people to do his bidding, Moréno kidnaps Irma Vep and has her switch allegiance, adding an amusing twist that functions as catalyst to this dark melodrama and revealing the "Apache" crime organization to be much more intricate that previously believed. The final two episodes raise the stakes with more kidnappings and the lives of loved ones being threatened, but it all ends in dramatically entertaining fashion. 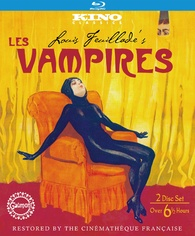 During its original theatrical run, Louis Feuillade's 'Les Vampires' caused a bit of an uproar, opening to a negative critical reception but successful nonetheless with the general public. It's actually rather humorous reading the publicity and criticism of the serials, referring to as basically offensive, tasteless and lacking in artistic merit. For the period, the films were definitely shocking, possibly even scandalous for portraying the crimes of others for the sake of entertainment. But looking at it today, it's clear many of those voices missed the real beauty and stylish elegance of its creator. Like 'Fantômas' before it and 'Judex' after it, Feuillade puts in 'Les Vampires' an artistry that's subtle and interestingly systematic, supplying the background action with almost as much fascinating detail as the foreground. Our eyes are constantly wandering about the frame as characters move all around their allotted space, which is essentially his technique for developing suspense at a time when the camera usually remained fixed to one location. With excellent editing that terrifically kept the action of two separate locations fluid and logical, the director pushed the drama with many great close-ups and put his audience in the thrill of the moment at a safe distance. Going against contemporary criticism, Feuillade is, in fact, imbuing his film serial with plenty of creativity and skill, merging aesthetic theatricality with his own blend of realism, making 'Les Vampires' a wonderful and influential classic of silent cinema. Kino Lorber brings 'Les Vampires' to Blu-ray as a two-disc package under the distributor's "Kino Classics" label. Housed inside a blue eco-vortex case with a sturdy slipcover, the two Region A locked, BD50 discs sit comfortably on opposing panels. At startup, they both go straight to the main menu with a still photo of the cover art and music playing in the background. Like other titles in the Kino Lorber catalog, 'Les Vampires' arrives to Blu-ray with a strong but not wholly impressive 1080p/AVC MPEG-4 encode. Taken from the best possible elements with a restoration by the Cinémathèque Française, the 1.33:1 image shows its age with lots of visible scratches, dirt specks, some judder and the perforations of the 35mm prints can be seen on either side of the frame. Contrast comes off a bit hot in several areas, ruining a good deal of the background information. Considering its age, however, the high-def transfer looks rather nice and fairly stable, not digressing too far from its best moments. Fine object detailing is reasonably sharp with appreciable texture in the clothing, the architecture of buildings in outdoor sequences and in the stage design of interior shots. A thinly-layered grain structure is ever presented and consistent, giving a lovely film-like quality. Black levels are very deep and quite beautiful in many scenes. All things considered, this classic serial that was the rage of French cinema during the silent era comes with a satisfying video presentation. All ten episodes come with a new musical score compiled and performed by the Mont Alto Motion Picture Orchestra. The uncompressed PCM stereo soundtrack is full of warmth and richness, creating a wide and very welcoming soundstage. Dynamics and acoustics are precise with distinct clarity in the orchestration, distinguishing between each instrument with incredibly detail. The string section in particular has a lovely even response at the mid-range without coming off too bright during the very short spurts of the higher frequencies. The rest of the track exhibits a healthy low-end that's accurate though not all that powerful, which is a mild drawback considering the use of brass and drum instruments throughout. But this is only a negligible nitpick to an otherwise excellent lossless mix. The only special feature is a trailer for Louis Feuillade's 'Fantômas' made by Kino Lorber. One of the great early works of the silent era, Louis Feuillade's 'Les Vampires' is an influential film serial that wasn't well-regarded but successful nonetheless during its initial one-year run. Starring the beautiful Musidora as one of the head ringleaders of an underground crime organization, the serial is today an admired work, appreciated for its creative technical style and for pushing the film medium forward as a unique art form that can provoke an emotional response as well as be the source of topical discussion. The Blu-ray presents the best possible video presentation of a now nearly 100-year-old film, accompanied by excellent audio. 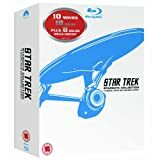 Supplements are unfortunately and disappointingly lacking, but those interested in seeing a great piece of history should give it a rent at the least.